Ca l’Antiga summer programme is a fully summer programme: the sea, the beaches, the sky and their surroundings: balustrades, wood stairs, walls, buoys… Yes, indeed, Maresme’s beaches look like that in summer time. Deep blues in the sky and the sea, warm sand and walls recently painted for the season or not as forgotten and devastated by the nature during winter. Yes, we are in front of typical summer colours and ‘normal’ elements. Normal and currently, daily viewed but not noticed by pedestrians, bath-lovers or runners. The eye of Pierre Radisic doesn’t slips, doesn’t ignore. He stops, his eye looks for the best position, the best option, the best point from where the nature organises itself creating images almost cubists, almost but absolutely true. All photographies exhibit at the “Decisive place” have been realised at different locations of the Maresme coast. Perhaps visitors will play to identify them and discover their origin. Difficult, interesting and risky task because Pierre Radisic has walked around a lot of beaches, going up and down by train, coming back again and again to the same place in order to get and catch the best light, the lightest sky, a quiet sea or a wild sea. At Ca l’Antiga we like to show the different light of the Maresme, this time the summer light. We are far from the silver light of the autumn. We are now in the field of franc and true colours: blue, white and yellow. And perhaps a cloud, only one, as Pierre Radisic comes from Brussels and although he likes and enjoys the Maresme weather a little, tiny cloud is always welcomed. We are building the summer programme around Pierre Radisic exhibition and we already have three important dates: Vernissage on Saturday 4 June, 2nd Anniversary of Ca l’Antiga on Saturday 18 June and Thursday 30 June the group “Filferro” will perform in the framework of the “Remor” Festival of Teià. The beaches of the Maresme: Pierre Radisic univers. 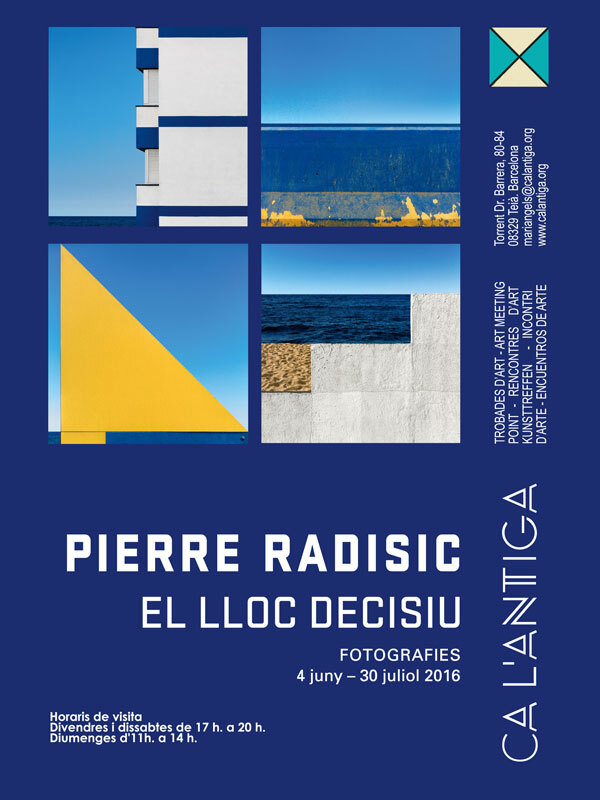 Pierre Radisic works in the limits of a unic theme – the marine – and its few components: sand, wooden fences, canalisations painted, blocks of concrete, the blue sea there far to the horizon and the blue skies, deep and impenetrable. “From limited resources, new shape emerges” wrote Georges Braque. Pierre Radisic summarises these sentence in the finder of his camera. The place he stops becomes the “decisive place” of his art. Most of the photographies showed at the exhibition have been published: “Decisive Place” with a text by Arno Rafael Minkkinen, ARP2 Publishing in English, French and Spanish. Among others he also published “Heavenly Bodies” Ed.Thinking Prints. The summer Festival Remor of Teià begins this year at Ca the Ancient. Concert of group Filferro will be the first of a fully month of July with several concerts at emblematic places of Teià.